October 28, 2008- At 17:20 stations 2 & 4 were dispatched to just outside the boro line on the Schuylkill Mountain Road for a tree down on wires, with wires possibly arcing. Duty Chief 720 arrived on scene and found that the same old stretch of road that has been giving us headaches in years past was at it again. This time, the culprit was a HUGE 3 inch tree that managed to become unearthed and rested upon high voltage wires. Crews from Engine 732 and Engine 737 tied a safety line to the tree and cut it off the lines as close to the base of the tree as possible. Chief 720 cleared himself and both engines in about 10 minutes. October 28, 2008- MVA with entrapment at Dock and Centre Ave.
October 28, 2008- Heavy rain and slick road conditions was the cause of an early morning motor vehicle accident with injuries and entrapment. Just after 07:30 stations 1 & 2 were dispatched to the intersection of Dock Street and Centre Ave, Schuylkill Haven Boro for the crash. Duty Chief 720 (Peel) was first to arrive on scene and confirmed only slight entrapment. Rescue 727 and Engine 732 arrived on scene and only had to "pop" the passenger side door to get the confined child out. After the person was extricated from the vehicle, he was sent to the local hospital for precautionary reasons. Meanwhile, remaining crews on scene, cleaned up debris and were soon cleared from the scene. 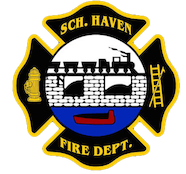 October 25, 2008- At 14:34 stations 1 & 4 were dispatched to the area of 1290 Schuylkill Mountain Road, South Manheim Twp. for a motor vehicle accident with unknown injuries. Duty Chief 720 (Peel) was first to arrive on scene and advised all incoming units of a single car accident with no injuries or entrapment, and also cancelled Rescue 727 while en route. Crews cleaned up the debris from the roadway, and waited to PSP to arrive. Out of town for just under an hour. October 20, 2008- MVA w/ entrapment in Wayne Twp. October 20, 2008- Rainbow Hose, Station 1 was sent to 208 Luckenbill Road, Wayne Twp. for a motor vehicle accident with entrapment right at 09:30. However, before Rescue 727 could go responding they were placed available by Chief 34-07 (Kearn) on scene confirming no entrapment and that the Rescue was not needed. October 18, 2008- Brush Fire in South Manheim Twp. October 18, 2008- At 21:27 the beeps came in, sending stations 2 & 4 to 17 Mintz Lane, South Manheim Twp. for a brush fire. Crews arrived on scene and climbed the mountain to find the landowners clearing the land and unintentionally starting the fire. They battled the small brush fire by using pre-connects and hand tools and were soon placed available. Total time out for the 2 companies was just over 1.5 hours. October 17, 2008- Just before 4AM Stations 1 & 2 were dispatched to the area of 356 Centre Avenue for a Motor Vehicle Accident w/ injuries. (Quick-Fil, A.K.A. Texaco) Before any fire units could get on scene, County Comm Center advised of a vehicle accident with injuries and confirming entrapment. Chief 722, Rescue 727, and Engine 732 went responding and found a victim entrapped in a vehicle (Tractor Trailer vs. a car). Crews on scene worked hard and got the victim out of the vehicle and sent them to an awaiting landing zone, set up by Fire District 41 (Cressona). Personnel on scene cleared the vehicles and debris from the scene and were placed available by incident command, Chief 722. August 15, 2008- 2nd Call to District! !